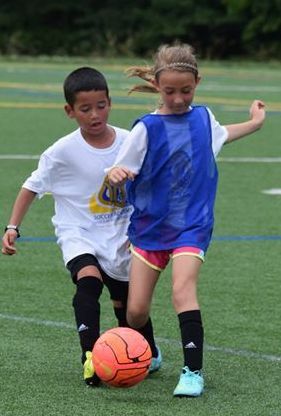 Soccer Academy’s 2019 Spring Break Camp will take place at Colin Powell E.S., 13340 Leland Road, Centreville, VA, April 15-19. Registration is now available! Options include 3 and 5 days! The cost for the Half Day Camp, which runs 9:00AM-noon is $205 for all five days. If you want to go out of town for a few days we offer a 3-day option for $130. The cost for the Full Day Camp, which runs 9:00AM-3:30PM is $265 for all five days. If you want to go out of town for a few days we offer a 3-day option for $165. The Spring Break Camp is designed to prepare players who wish to play at higher level the game or who are interested in improving their game for the next season. At the youngest ages, we focus on developing the foundation skills of soccer: dribbling, ball control, kicking, shooting and passing. With older players, we advance to receiving balls, 1v1 attack, tackling and heading. Each skill is taught using a variety of methods, increasing the level of challenge as the player refines the skill. Eventually, the player is asked to perform the skill under match conditions. Older players are also taught soccer tactics and the basics of team play, including combination plays, ball possession, defending as a group, speed of play, and others. The Mini Neighborhood Camp is designed to introduce the game of soccer to the youngest developing players. Each day’s activities are varied and include lots of fun games created explicitly for young players. They will learn dribbling, ball control and kicking through age-appropriate instruction and small-sided games of 3v3 and 4v4. Each activity has been designed to develop coordination, physical skills and social interaction. Players are grouped to match their age and ability. Our staff is specifically selected and trained to work with the younger player. The 7-year-old player has the choice of attending the Mini Camp or Full Day program, but in either case will receive the same instruction. The program runs from 9:00AM-12:00PM daily.